If you have an Apple watch, you are very fortunate as you have access to everything on your wrist. You can enjoy its features and can also have a proper check on weather conditions to make your plans. 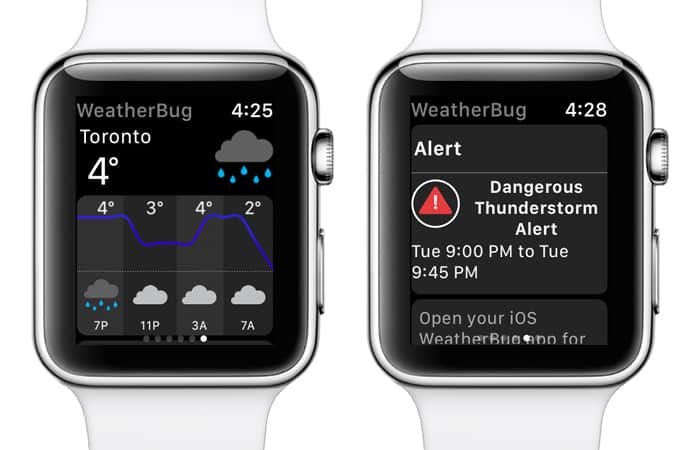 To do this, you need a best Apple watch’s weather app. You must know that there are several free weather apps are available in the market, and you can choose the best one among all. 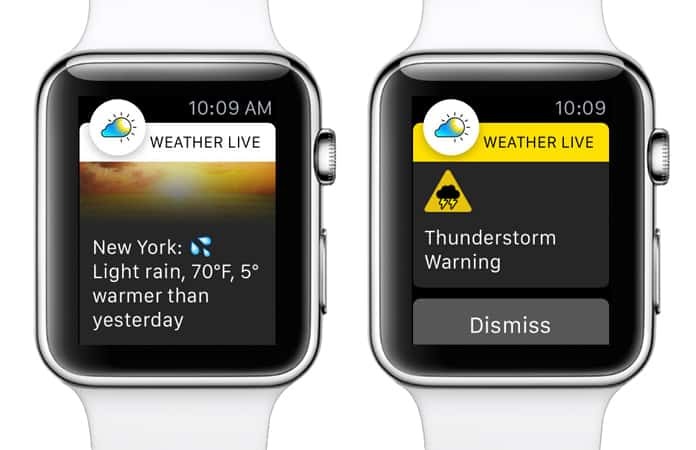 We are providing you the details of best weather apps for Apple Watch to help you make your decision. 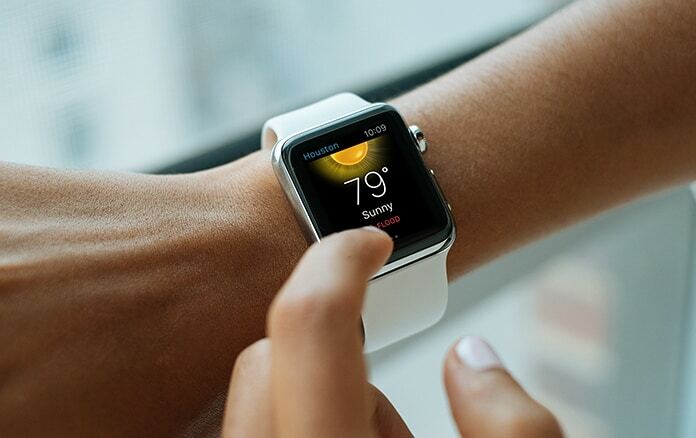 Have a look at following amazing apps for weather forecasting and other weather details on your Apple watch. Weather Live is a fabulous app which allows you to have a proper check on the weather conditions in your settings area. Whenever you open this app on your watch, it will instantly show the temperature details and other complete weather conditions on your wrist. Due to this app, you don’t need to worry about thinking about change in weather conditions, and you can see weather forecasts with the help of Weather Live. It is a free app and provides you the latest hourly basis details and updates about the weather and current temperature. Its icons are very attractive and easily understandable. You can quickly understand whether there is rain, sun or clouds by seeing the icons. In short, this is the best app, and you will get enough weather details using this app on a daily basis. WeatherBug is another great app which can be in your Apple watch. This app is different from others, and it provides enough details about weather forecasting, present weather situations and any allergy in the air details. You will see the current temperature on your watch screen. To see other information on forecasting and details about the air, you have to open the app. The best thing about the app is that it alerts you about the dangerous situations related to weather. You may be informed several times in one day due to changing in climate worst conditions. You can see and quickly understand the temperature charts and also there is enough detail about the allergy in the air. 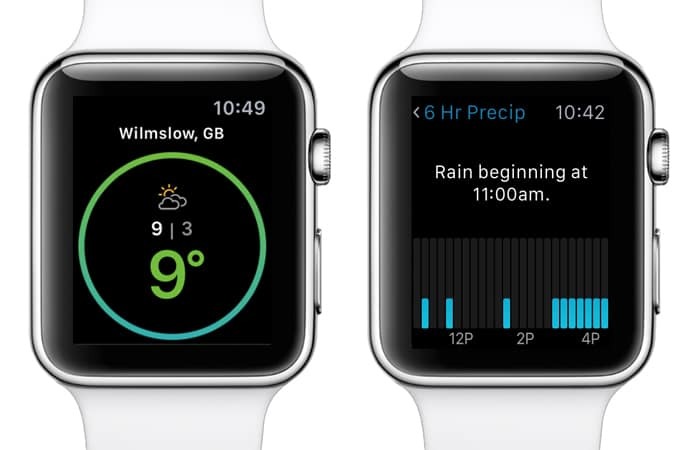 So, you can set your routines by taking help from this free weather app for your Apple Watch. If you want to be alert about changing conditions of weather, this app is specially designed for you. It is a great free app which is available for Apple Watch and ready to fulfill your needs. You can observe weather forecasts, current conditions of weather and alerts which are important. One another feature of this app is that you can see its radar maps. These radar maps will easily show your present location and the severe weather conditions to compare the distance between you. This feature will help you to know the distance of bad weather conditions from you and you can easily make necessary precautions. Additionally, you would enjoy hourly weather updates and forecasts as well as you can see the weather forecast for next ten days. So, you can choose this app when you want to check weather conditions for short time and longtime duration and get alerts about the weather situations. These weather apps for Apple Watch are not only free to download but they will also give you more options to get the most out of your current conditions and weather forecasts. So, do you use one of these cool apps or do you have a different one? Please share your thoughts in the comments below.